Sometimes the blessings we receive mean so much to us, that we must really stop and make note of them and give a Shout of Thanks! Last night I poured my heart out to my husband about how I am running out of time to do all I have to do for the family, the house, the adoption, the fundraising. I need help and the only one that can help me is God himself. So Dale tells me to take a 10 day break from it all and at the end of 10 days we'll see where and how God has led. 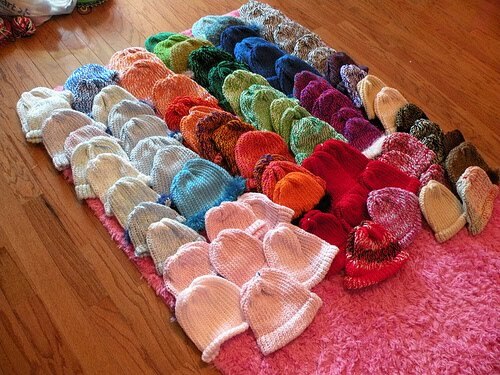 One of the many things on the BIG TO DO LIST is make beanie hats for the babies at the orphanage. We are supposed to take gifts to the little ones left behind. We have taken bottles, medicine, clothes, bought washing machines, etc in the past. But now funds are so very, very tight. Okay, funds are not tight. Funds are, well, non-existant. So, we have all this yarn and decided we would learn to make beanie hats. But to make 25-50 beanie hats for extreme-novice crocheters is an overwhelming task. I have never crocheted anything worthy of ever giving away and Kya is just 7 years old. But we were going to give it a whirl. And so it sat on the BIG TO DO LIST. Do you know what this is? It's beanie hats for babies. Not just any babies....for babies in Chinese orphanages. Someone is asking us to deliver them to our child's orphanage. She is 16 years old and has made 400 hats for Chinese orphans, and she needs us to deliver them for her. That's what these hats are! "Our God is SOOOOO Big, Soooooo Strong and soooooo Mighty, there's nothing Our God cannot do!" : ) I love it!!! I'm glad you shared it Dawn. Praise the Lord! Who can out give God. He sure knows when to give doesn't He? What a great and wonderful God. He takes not only care of the orphans He takes care of us as well, when we just can't go any further. What an awesome post - love it - gave me chills. Can't wait to hear how the delivery goes. God is amazing!